You can buy an H2Glow for the safety of the little ones — though in the fine print of their installation PDF, Sector Labs points out that the H2Glow is not a safety device — or just because it looks really cool. 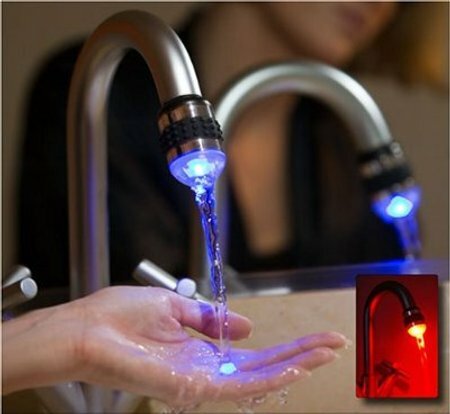 It makes your water glow as it flows out of the tap, blue if it’s safe to touch and red if it gets too hot. Measuring just 34 x 51mm, the H2Glow replaces the aerator on your faucet. For environmentally or economically conscience readers, it also limits the flow to 2 GPM. The H2Glow runs $17 plus $5 shipping from Amazon. Two universal adapters to fit the H2Glow to your faucet are included, as well as the three LR44 batteries required for operation. I have one of these from Thinkgeek.com. If you have hard water, they become pretty useless quickly; the temperature sensor on this is very tiny, and with just a little bit of lime buildup, it stops changing color. I also have the shower version; it doesn’t even need a battery, as the water pressure spins a turbine for the power. That one must have a larger sensor or something, as I’ve had no problem with it. Thinkgeek carries a competing product; not H2Glow. In other words, you own a totally different product. I could never buy myself one of these because I’d feel compelled to open it up and switch the blue LED to activate when the water was hotter and the red when it was colder (as in blue flames and red flames). Yes, I know this a total geek pet peeve. @Daniel: does this version also have problems with hard water? If it didn’t have a flow limiter, I’d consider it. I hate being nannied. Possible Improvements I’d like to see before it’s useful to me. 1. A “sweet spot” where the red and blue flicker or blink or something to tell me it’s in the warm region I like. 2. A way to adjust said region. Otherwise, there’s no way to tell if it’ll burn my skin or 1º from switching to blue. It’s not kid safe until I can tell. I guess I too was disappointed that the shade of the water didn’t turn from blue to purple to red as the water got hotter. Seems kind of like some sort of stupid lawyer or management decision, ’cause you know that’s what the engineers would have wanted to do. You’d just vary the current to the red and blue LED’s based on the water temperature. H2Glow isn’t sold via Thinkgeek. They sell our competitor’s product, which doesn’t perform as well as our product. You can find our product on Amazon or directly from our website (www.sectorlabs.com). By the way, we’ve got 4.8/5 stars on Amazon.